At Varsity Pools & Patios, we understand that a swimming pool is just a part of the bigger picture that you call your home. Above and around the water is a living landscape. It’s a place where families come to cool off, but to also find joy, exhilaration, tranquility and the pleasure of good company. A private paradise. Today, Varsity Pools creates complete backyard environments, with custom pool designs as the centerpiece of your backyard paradise. We begin with the lives that our customers lead, then marry their vision with their needs and passions. 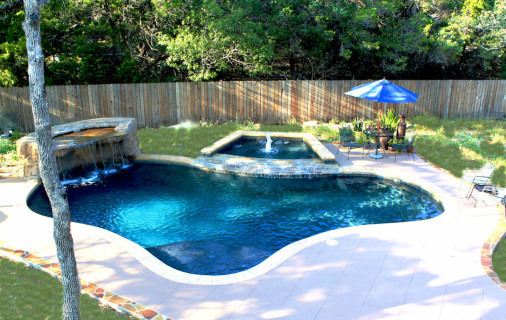 Then we design and build flexible, elegant swimming pools that bring their backyard paradise to life. Due to the South Central Texas climate, our customers routinely tell us that they never thought they’d be in their pool so much. With paradise in your own backyard, we understand.